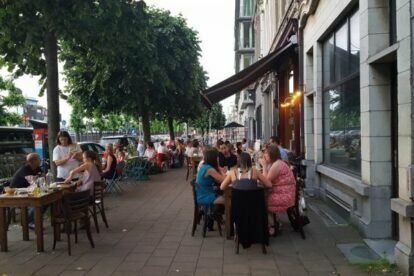 Over the years this restaurant has become a fixed value in Antwerp, for me anyway. Especially during summer, when all the tables are put outside, I like visiting Varelli. The mouth-watering scents of the dishes always make me feel like asking for a free table. Sometimes that works, but to play it safe, you better book a table in advance. The menu seems to be made for me: lots of meze, not as an appetizer but as a meal – that’s all I want. Generally we choose two small dishes per person and share the lot; as you know: sharing is caring! The ‘Varelli Special’ is one of my favourites: Cretan bread with grated tomato, feta, oregano and olive oil. Seriously, I could eat this in the morning, afternoon and evening. Do not forget to take a look at the suggestions which are delicious as well. The staff often has to run to serve everyone, but they are always super friendly and help you with a smile.